Tamang, group of three is Alina, sister Bishnu and Sadhana. Above all our children in Hattiban, 12 of them. We registered them all today. These children live in very poor conditions but it is always a pleasure to visit them all here. The Nepal Education is a small privately run charity that I started in 2004 to help educate children in Kathmandu, Nepal. These children are from very poor families who cannot afford the yearly school fee nor the cost of school uniforms and the requisite school supplies. Some of the children have never attended school while others have had to drop out as their parents can no longer afford to send them because of financial hardship. The Nepal Education Fund currently has approx.160 children sponsored to go to school from caring families in Canada, England, Australia, New Zealand, US and Qatar. We also are educating approx 80 women in literacy programs. 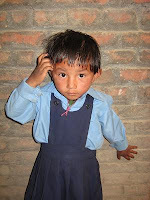 Our trusted Nepali staff and myself select the children. Our staff in Nepal runs the programme in Nepal and I visit twice per year spending two months every spring visiting all children and schools. 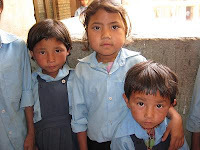 If a selected Nepali family is committed to educating their children, the children are registered in school, uniforms are purchased and school supplies bought. In addition, the children are regularly monitored to check upon their progress. NEF is registered with the Social Welfare Council in Nepal.